What does Orchard View naturals specialise in? This involves the use of essential oils for heath and beauty. These complex plant extracts have numerous beneficial properties. 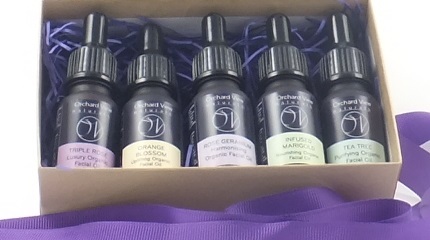 I have a well-established therapy practice in South Somerset and I produce the “OV” range of lovingly made, hand-blended, professional facial oils. Where is Orchard View naturals based? South Somerset, UK. It’s a beautiful part of the world, unspoiled, with plenty of wide open spaces. There’s a strong sense of community and while we’re in the countryside, it’s easy to get a ‘city fix’ in nearby Bristol or Exeter and London is easily accessible by train, too. Although my core therapy customers are obviously local, one of the things I wanted to be able to do was offer the Capsule Collection to a wider audience. I have achieved this through my website where there's a secure online shop which is accessible worldwide. What inspired you to create a business that solely focuses on plant-based facial oils? The Capsule Collection evolved naturally. After setting up my therapy practice in Somerset eight years ago, I became fascinated by the positive effects that essential oils had on the body, the senses and especially, the skin. The results were clearly visible and my customers spoke with me their experiences. This is one way in which I believe my business is different to many larger companies. I work with my customers, personally, on a daily basis, in my therapy clinic. Producing a skincare line is a labour of love. It took me many hours to study cosmetic law, trading standards, distance selling regulations etc. The more pleasurable side for me, was creating blends that were safe, compliant, effective and gorgeous to use. A focus group of customers were invaluable in helping me get the texture and aroma exactly right for each individual blend. I am firmly against animal testing for cosmetics. It makes no sense to me at all! I’m delighted that this has now been banned in Europe. This ban has had a knock-on effect on some other countries, but there is a lot more to be done if the ban is to become worldwide. For OV products, I get a written acknowledgement from all my suppliers that they do not test on animals. My suppliers generally are small, artisan companies based in the UK, whose philosophies would be similar to my own. Do these ingredients affect the outcome in comparison with non plant-based oils? Absolutely. The way these ingredients are produced means that they retain a ‘life-force’ and a high content of nutrients for the skin. No pesticides or herbicides are used to grow the botanicals in an organic oil. The ingredients in OV products are, we believe, the best available. They are vital, authentic and as close to nature as possible. They are 99.5% organic, (Soil Association certified ingredients) and 100% of natural origin. Unlike refined oils or mineral oils (which have no active ingredients), the oils in OV blends are predominantly plant oils, which naturally contain high amounts of skin-enhancing and anti-ageing phytonutrients, such as, antioxidants, phytosterols, fatty acids, carotenoids, chlorophylls, phospholipids and vitamins. In four of the blends in our collection, we use essential oils, which are precious extracts with complex properties that impact the skin and the senses. Many have been used for centuries for their antioxidant, anti-inflammatory, anti-acne, antiaging, antimutagenic, antimicrobial, astringent, bactericidal, cytophylactic and vasoconstrictive properties. The skin requires feeding with many nutrients and the skin’s lipidic barrier is complex, so a skilful blend which delivers a range of different benefits is a must-have. What are the challenges you have faced? The challenge of working with organic plant oils is that they have very distinct colours and odours. Working on the creation of the OV Capsule Collection involved making many batches before I was able to launch blends that were full of active ingredients yet at the same time, smelt pleasant to use. The ‘Infused Marigold’ blend was the most challenging as this contains no essential oils (for very sensitive skin), thus requiring a very delicate balance of ingredients. The final blend has a gentle aroma which users find adds to the sensory experience of using the oil. Also, working with ingredients which are made by nature, there are environmental factors which can affect availability and costs. For example, recently there was a worldwide shortage of Calendula oil, so I was unable to get hold of any for around a month. The Rose harvest is always interesting! There have been times when Rose Otto availability has been limited. In the past few years, the price of Jojoba has escalated, among others. It’s a challenge when customers expect their products on time and at a fixed price. Luckily, we haven’t had any major problems, which have inhibited production too dramatically! Of course, the compliance side of producing cosmetics is always a challenge, simply in terms of the amount of bureaucracy and the costs involved, especially with ever-changing EU regulations. However I feel it is so important for small artisan producers to have a place in the market amongst the ‘Big Boys’, so it’s worth going that extra mile. For someone who hasn't purchased Orchard View facial oils before and doesn't know what to buy; is there a particularly popular one you can name? OV Triple Rose has received many independent reviews and has become our best-seller. It helps most skin concerns, from dryness to acne. Some people have reported that it has helped reduce the appearance of scars and others have said that it helps them sleep better. Triple Rose has been independently reviewed by many in the beauty industry and there is a Testimonial page on the website highlighting this. We rarely pay for advertising are a tiny company (just me!) and don’’t have a budget for advertising as such, so are very proud of the independent reviews we have received and grateful to the generous industry professionals and bloggers who have championed our products. For a tiny company like us, this kind of support makes a big difference. I sell small, medium and large sizes of all of the blends on the website, so it is relatively inexpensive to try something out. Are Orchard View facial oils suitable for everyone? If you have sensitive skin, a patch test is recommended. Anyone with a nut or seed allergy, should steer clear and in pregnancy, sometimes it is advisable to avoid essential oils altogether. If you have any other allergy, it's best to mention it before making any purchases. Each blend has been designed with particular skin types or conditions in mind, but they are also often interchangeable. Triple Rose was originally designed for dry skin although it has proven to be much more versatile. Orange Blossom is a favourite for mature skin types, Tea Tree for breakouts, Rose Geranium for combination skin and Infused Marigold for sensitive and dry skin. For some, their choice is very much driven by the aroma. I like to encourage people to ‘mix and match’ depending on their skin’s needs and their mood that day. Is Orchard View naturals owned by, or in partnership with, another company that tests on animals or sell non-vegan products? No. OV is an independent small UK business owned by Lucy Stevens. Tell me a bit about yourself before you launched this company? I was encouraged from an early age to think creatively. As a teen I would make my own beauty products from the kitchen cupboards. I have always been creative and have a degree in Creative Arts and an MA in Arts Management. I worked in art galleries at the beginning of my career. Working as a therapist was a lifestyle change for me and one that I love. It is an outlet for my creativity, gives me flexibility and allows me to work with wonderful people and to truly make a difference. What is your vision for the future of Orchard View? For now, I’m giving my full attention to my therapy clinic and the OV Capsule Collection. I have plenty of ideas, so in the future, who knows? Fancy trying out some of Orchard View range? Lucy has kindly offered readers 10% off everything, using the promotional code PLANTSHIFT when checking out at www.OVnaturals.co.uk The offer will expire on 1st December 2014. Did you like this post? Want to receive others like it? Click here to sign up for Plant Shift's monthly newsletter.